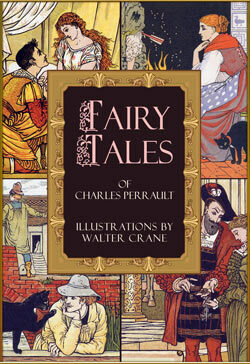 The book includes five famous tales of Charles Perrault illustrated by Walter Crane (40 color illustrations): Little Red Riding Hood; The Master Cat, or Puss in Boots; Blue Beard; The Sleeping Beauty in the Woods; Cinderella, or The Little Glass Slipper. Walter Crane was a prominent book illustrator of the 19th century. In cooperation with Edmund Evans, he designed picture books printed in color, which became the most popular children’s books at the time thanks to their high level of craftsmanship and low price. Crane’s style shows the influence of the art of the Renaissance and Japanese prints (ukiyo-e). He designed his books according to the belief that "children, like the ancient Egyptians, appear to see most things in profile, and like definite statements in design. They prefer well-defined forms and bright, frank color. They don’t want to bother about three dimensions. They can accept symbolic representations. They themselves employ drawing... as a kind of picture-writing, and eagerly follow a pictured story." Crane’s work set the standards of taste in the Victorian children’s book industry and earned him the reputation of "the father of the illustrated children’s book".